Good news for Virtual Reality users and people interested in getting into virtual reality. Today Oculus announced the Oculus Rift S Virtual Reality headset at the Game Development Conference in San Francisco in the United States of America. The Virtual Reality headset offers a better VR headset display 1,280 × 1,440 per eye (2,560 × 1,440 total) which is a big improvement on the previous version. The Oculus Rift S also uses inside out tracking which will make a room scale setup much more easier to setup with less cables needed. The Oculus Rift S uses Insight tracking to create a 6DOF Virtual Reality experience with out external sensors or cameras. The Oculus Rift S virtual reality headset have 5 cameras build inside the virtual reality headset to track the player and movements of the player. The Oculus Rift S controllers are essentially identical to the original Oculus Touch controllers, but with the tracking ring on the top of the controllers instead of the bottom. This allows the IR LEDs inside the rings of the controller to be seen by the Oculus Rift S VR headset. Oculus is known to have the Best Virtual Reality controllers at the moment, and it is exciting to see that the Oculus Rift S will use these. 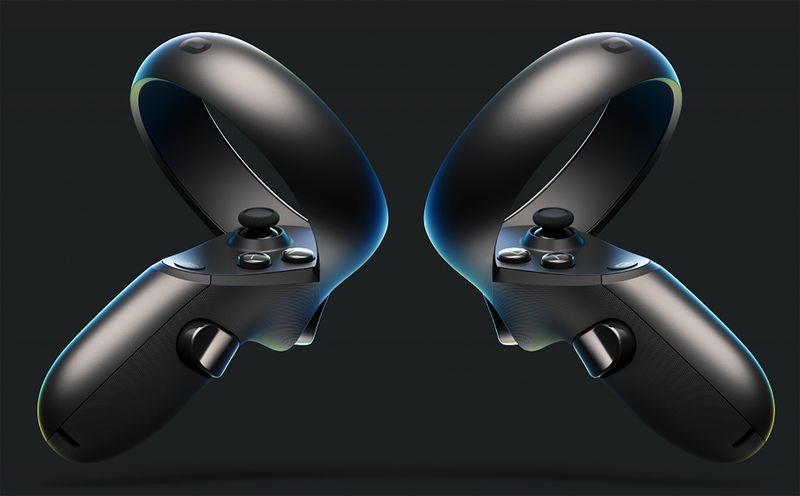 The Oculus Quest will use the same Virtual Reality controllers as the Oculus Rift S.
Oculus Rift S Controllers – The best commercial Virtual Reality controllers. Please note that these specifications might still change.